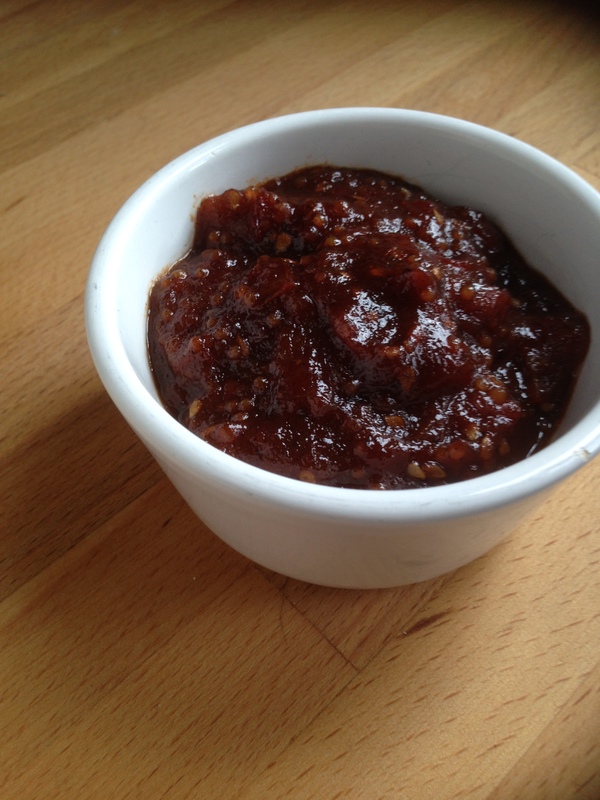 I love a good chutney and have even got my 7 year old asking for chutney in her sandwiches!! This is a nice simple one.. I only had 1lb of tomatoes so had to quarter everything else.. 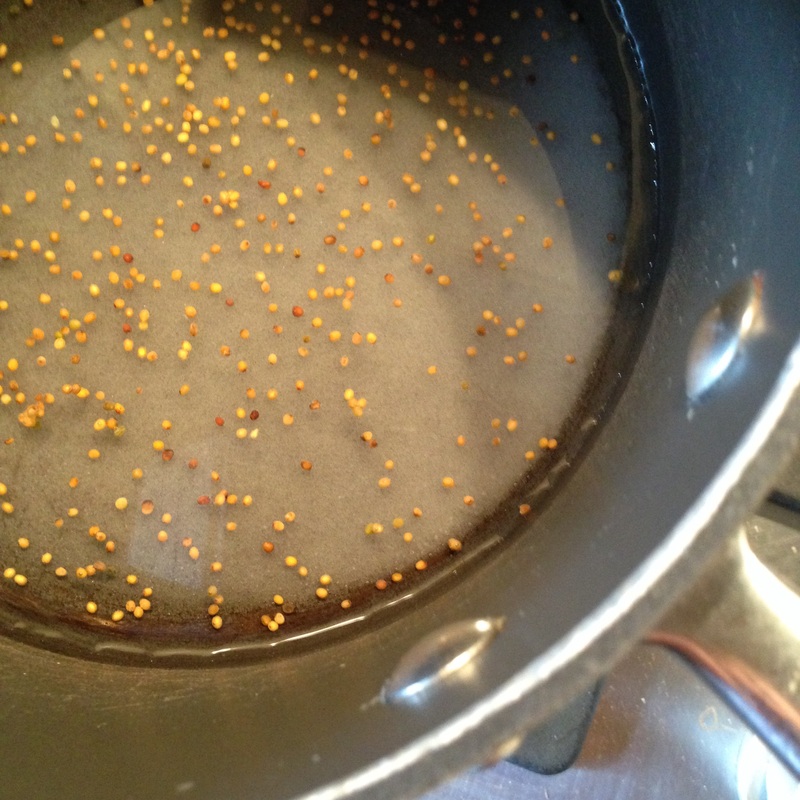 Even measuring out a quarter of the mustard seeds, allspice and cayenne pepper seems like a decent amount.. The recipe says to put the mustard seeds and allspice in muslin, but I don’t have any so decided to just throw them in with the skinned tomatoes.. 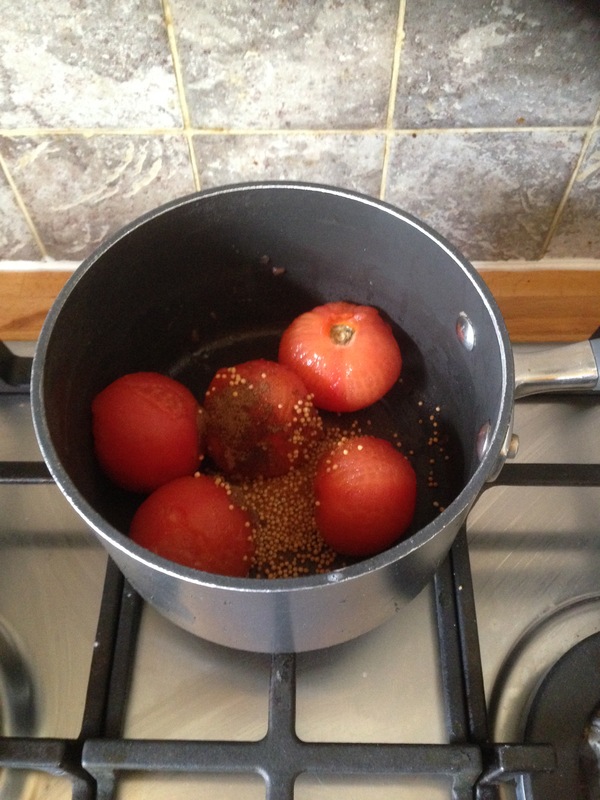 The tomatoes and spices are left to cook and do pretty quickly turn into a pulp, did not take as long as the recipes suggests. So then I added the sugar, salt and vinegar..
That was all left to simmer until it was thick with no liquid, which did take a bit longer. I think after about 30 minutes it was looking thick and dark and sticky, and the smell in th kitchen was fab! 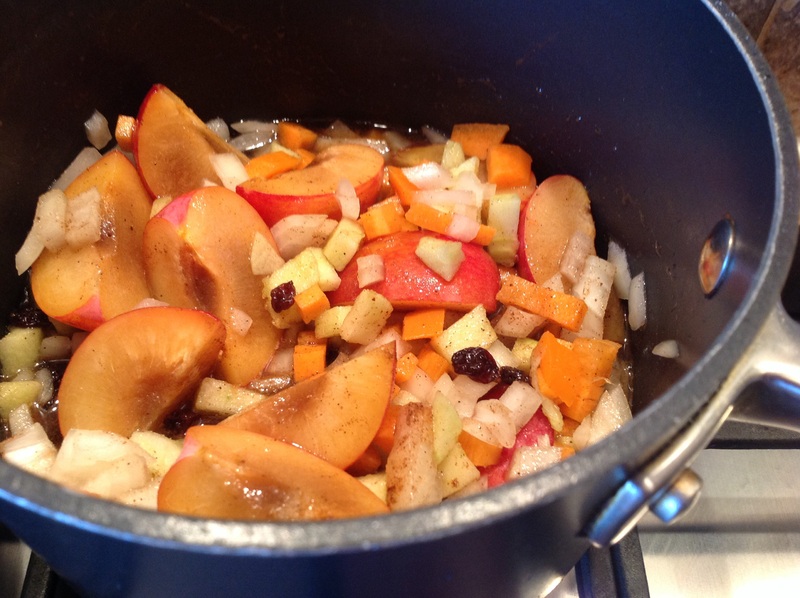 By the time it had simmered down to a thick consistency, I really didn’t have much left! I only had enough to fill one ramekin! I left it to cool for a while before trying. 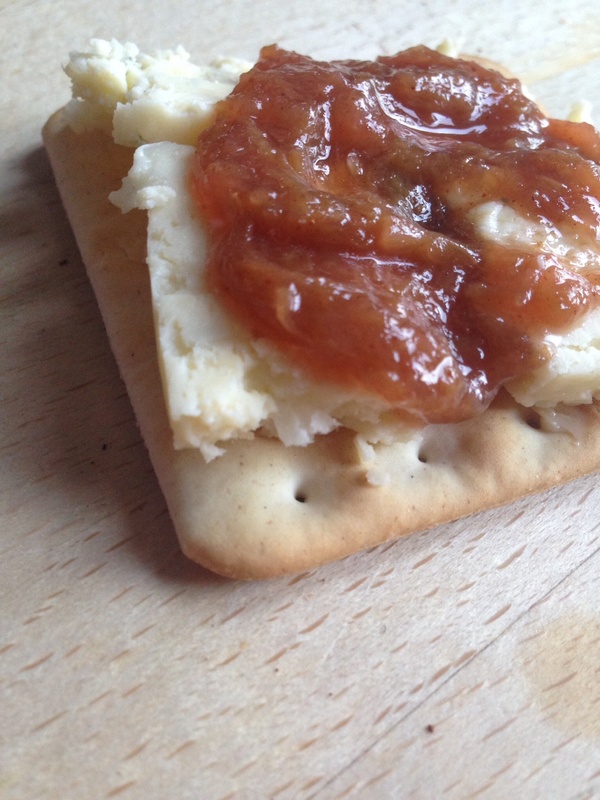 I tried it first with some cheese and crackers and was really good, it is quite a thick chutney that has to be spread on rather than drip down the edges! The flavour is great and I think I had nearly half of it in one sitting! 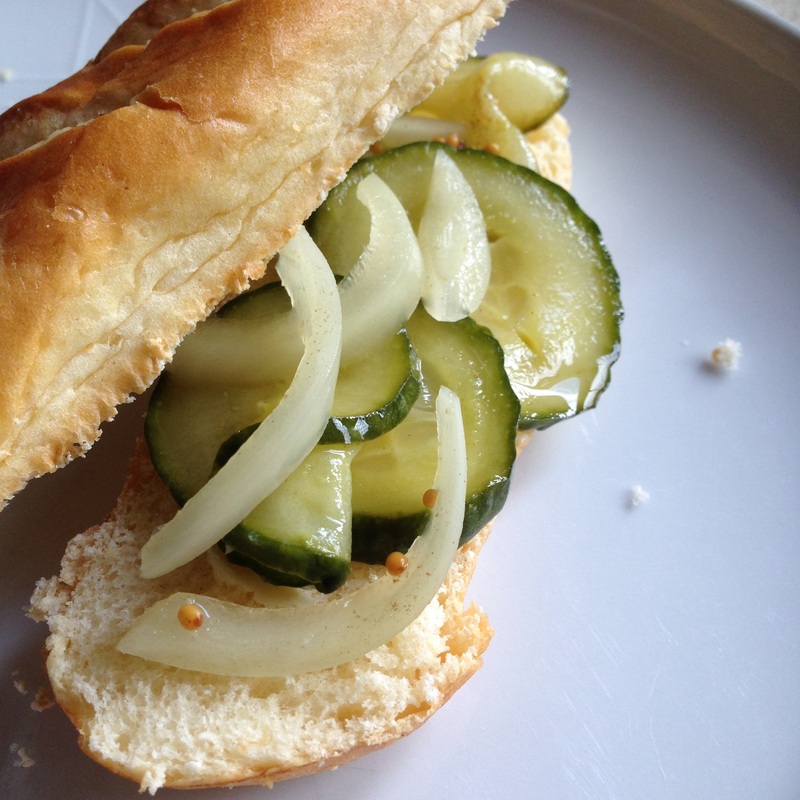 I think my favourite ever sandwich filling is cheese and pickle, there are a few pickle recipes in the book but this sounded like the easiest to start with.. 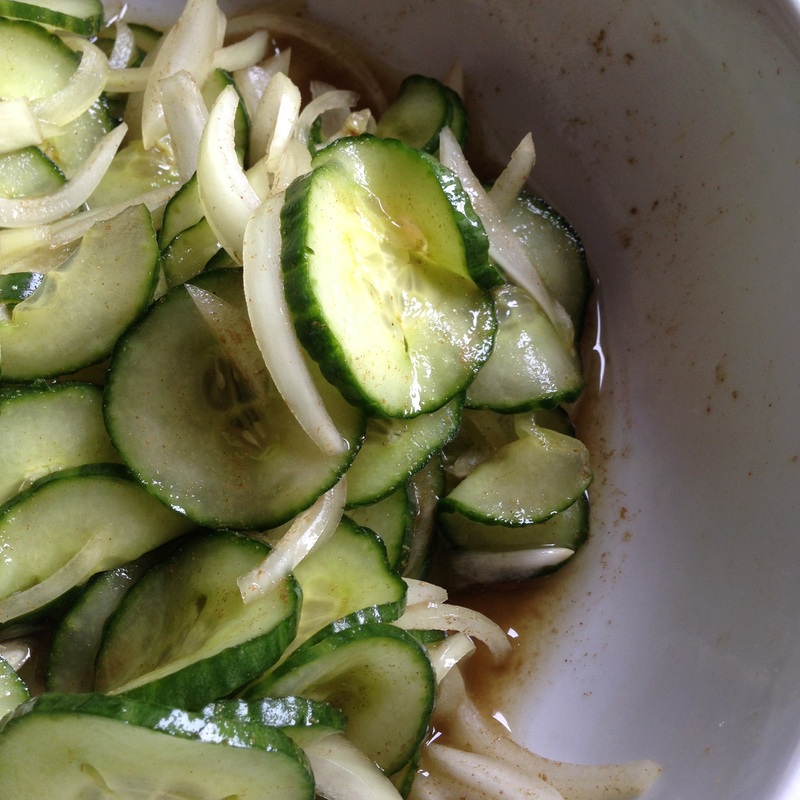 So there’s not much to this recipe, cucumber and onion slicing and that’s about all the real effort required! I couldn’t get celery seeds but I do have celery salt. So I opted to use that to sprinkle over the veg so that I was still getting some sort of celery hit! 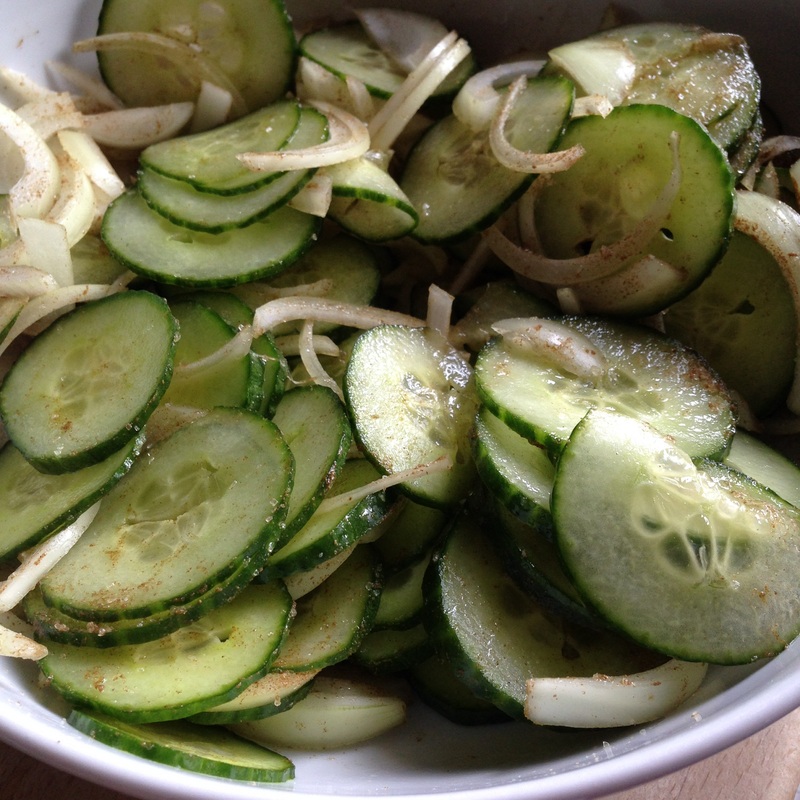 After an hour a lot if liquid had been released from the cucumber and onion, and they were really soft.. I had a little taste at this point and it’s pretty good! 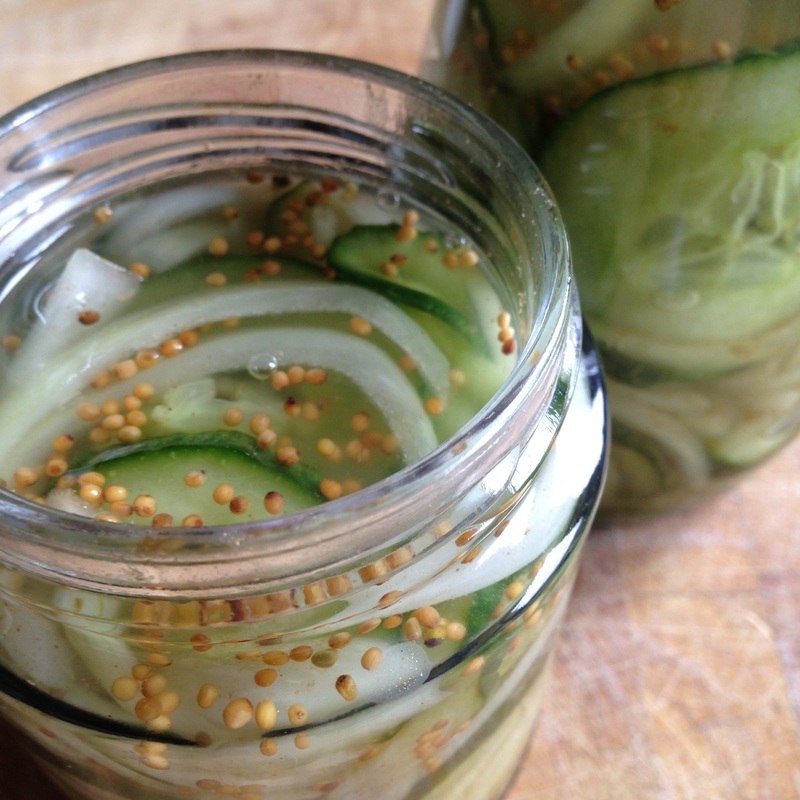 Then I put the vingest, sugar and mustard seeds on..
Once that’s been on the hob for a few minutes I poured it over the cucumber and onion that’s been packed into sterilised jars.. I actually made this yesterday as I wanted to leave for at least a day to try it. As the recipe says it great with bread and butter that’s what I had it with.. 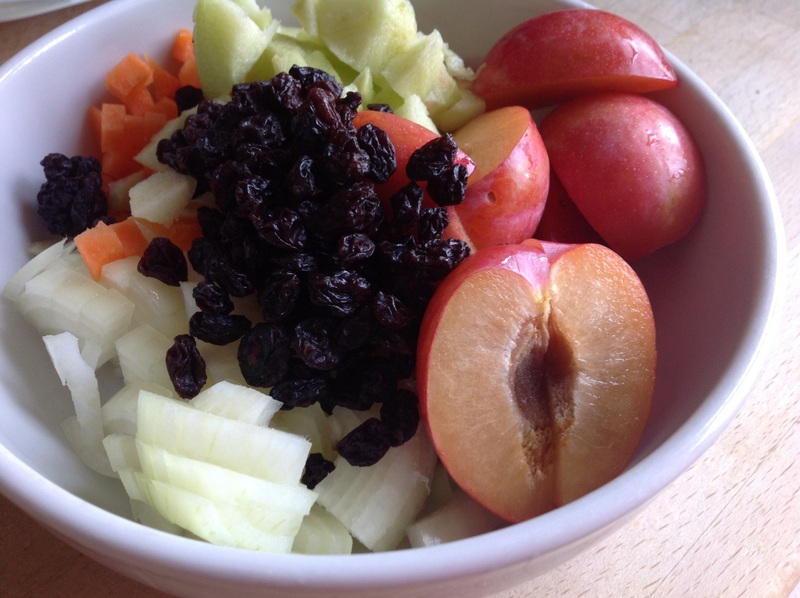 It does seem a bit unusal having just a sandwich and pickle but for an afternoon snack this was brilliant!! I don’t think it should be limited to bread and butter, I’m going to try this in my cheese sandwiches!! Would I make this again? 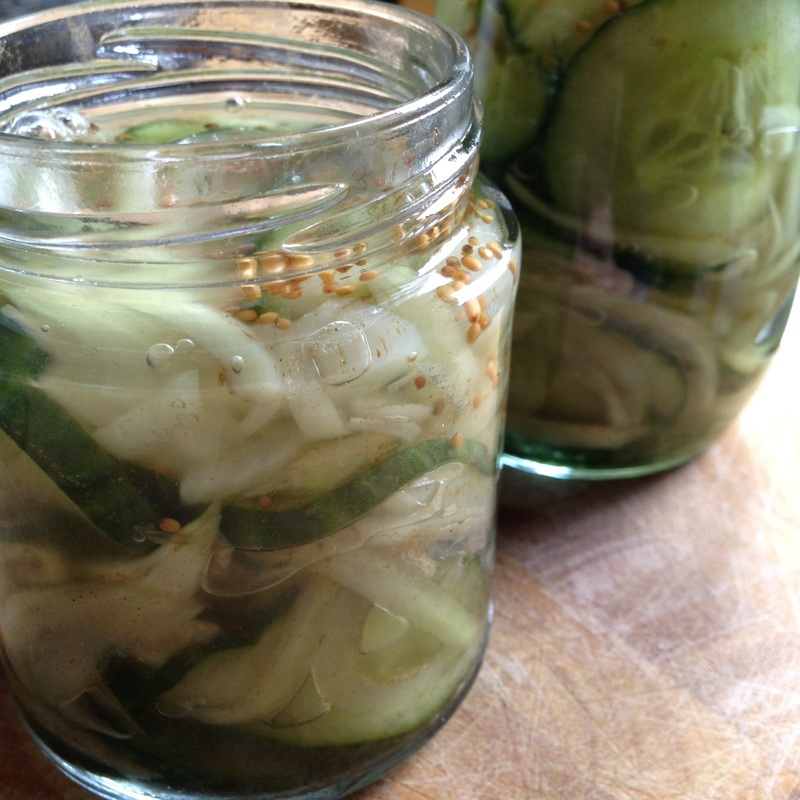 Yes, I only made with one cucumber and ended up with 2 jars but pretty sure that won’t last long.. 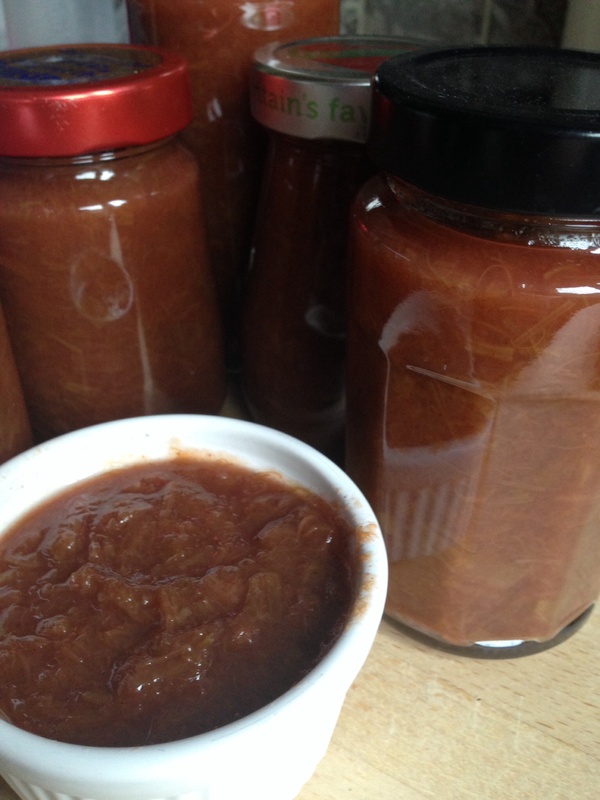 I do love making chutney and also love eating it with some crackers and cheese or in a sandwich.. I didn’t have enough vinegar in the cupboard to make the full amount, only had a quarter of a pint so I divided everything else by 8! The smells from the spices was great..
Then there’s a bit of chopping to do. 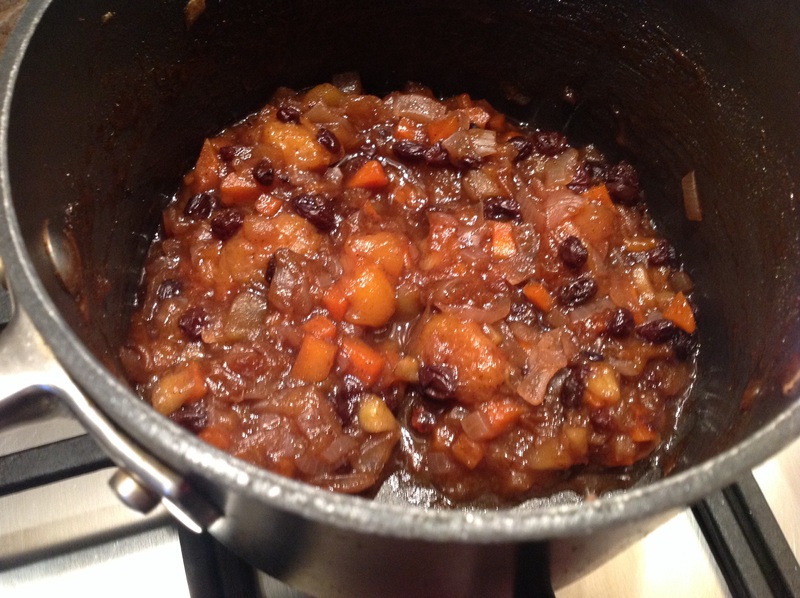 I did think it was unusual to have carrot in a chutney.. 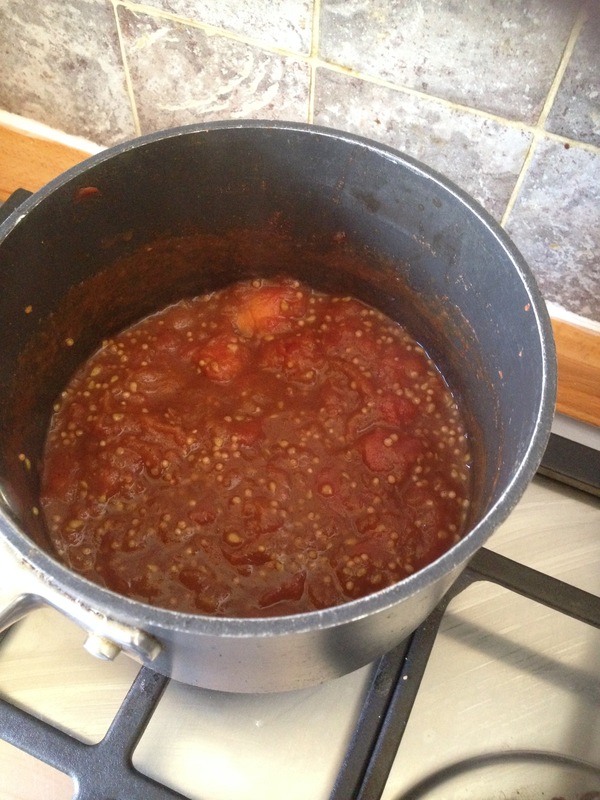 I think this was simmering for about 30 minutes before there was no free liquid, and was smelling even better.. 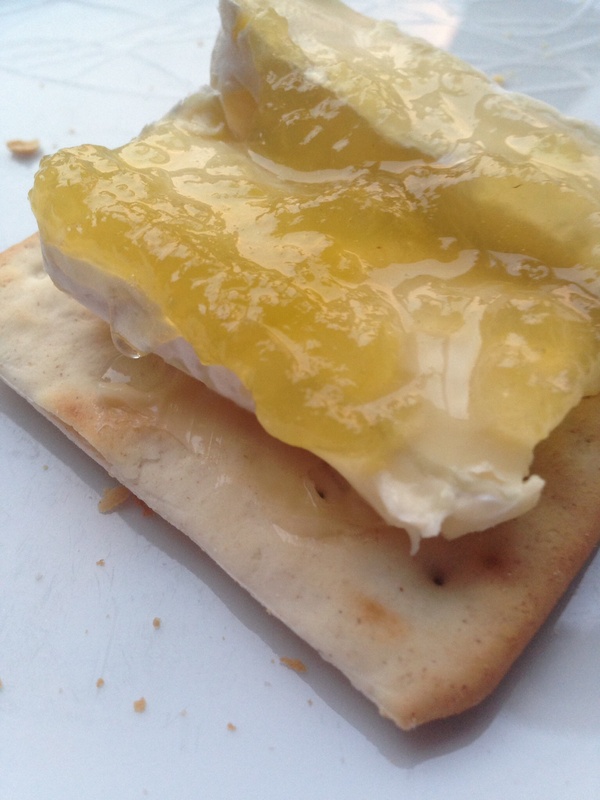 I left this to cool for a bit and first tried it on some crackers and cheese and is brilliant! 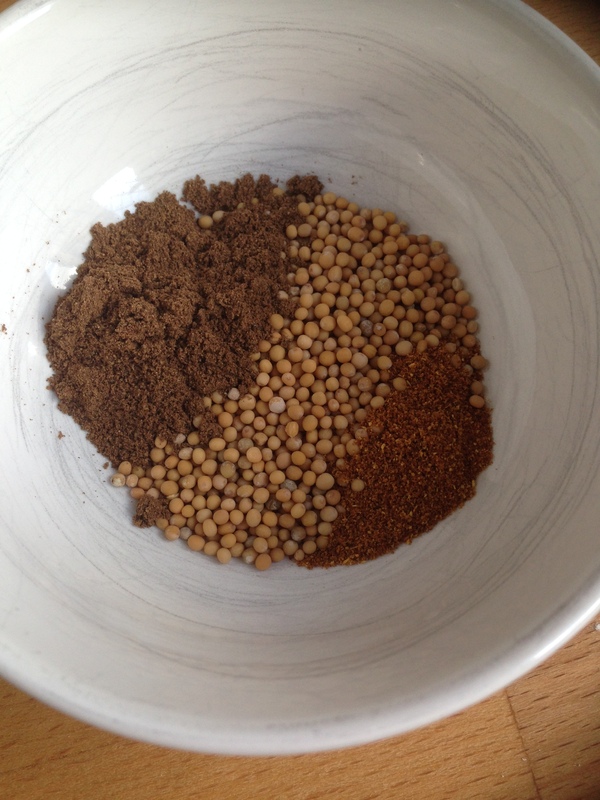 It’s sweet but with a nice sharpness and the flavour from the spices is great! 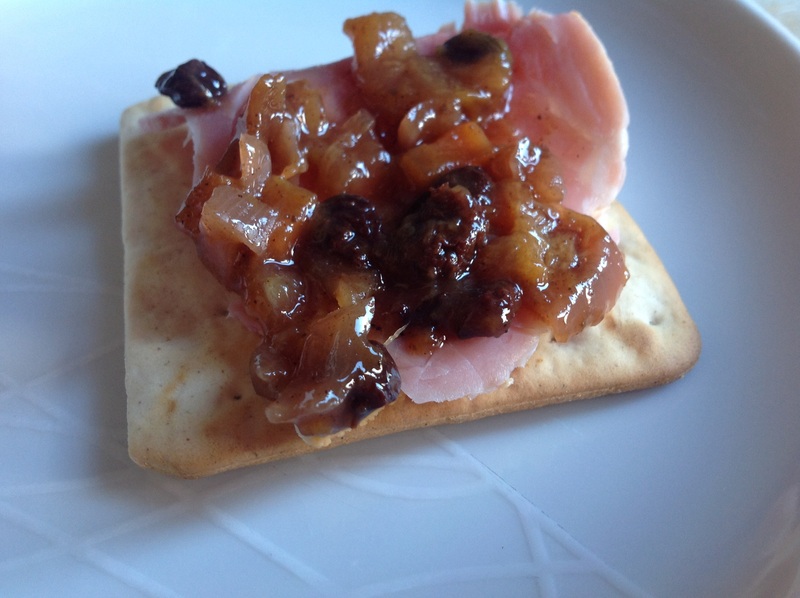 I then let it cool completely and had with some ham and is just as good.. 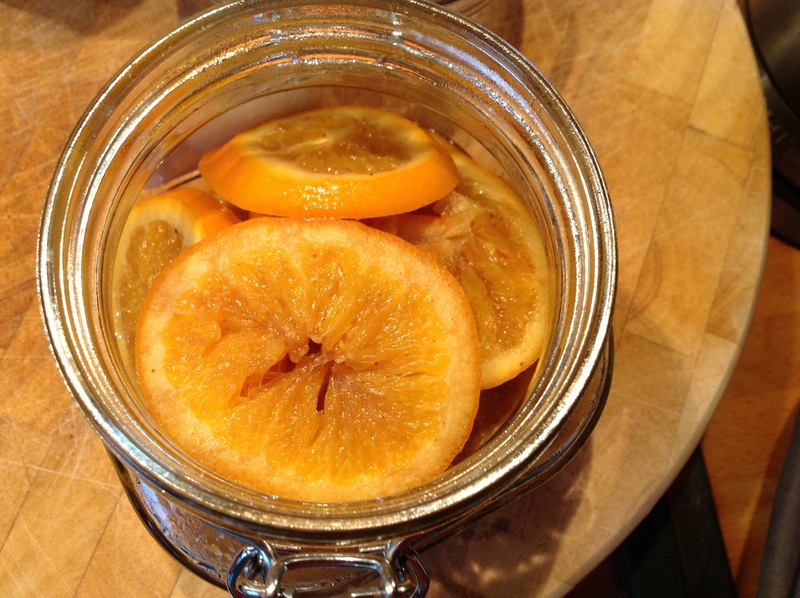 I only ended up with one jar which is not going to last long! 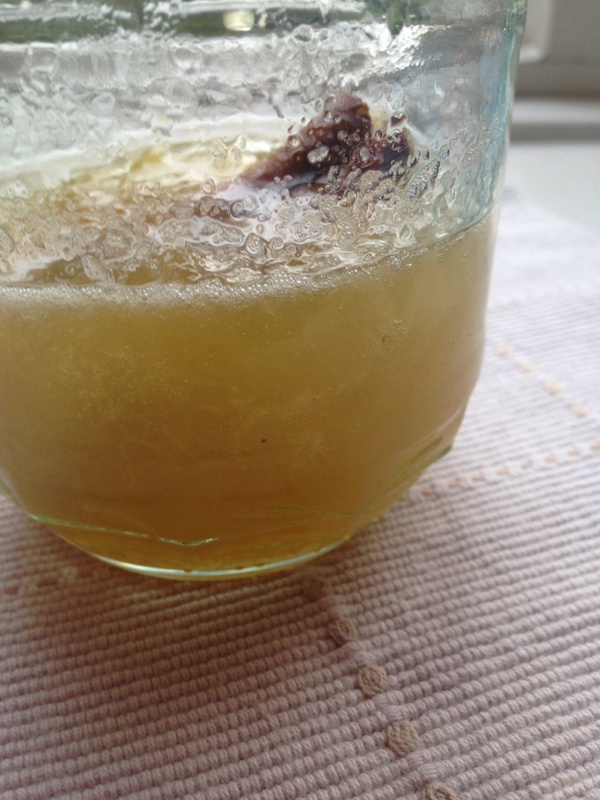 I think the longer this gets left the better it tastes, but in order to test that I’ll need to make more. Would I make this again? 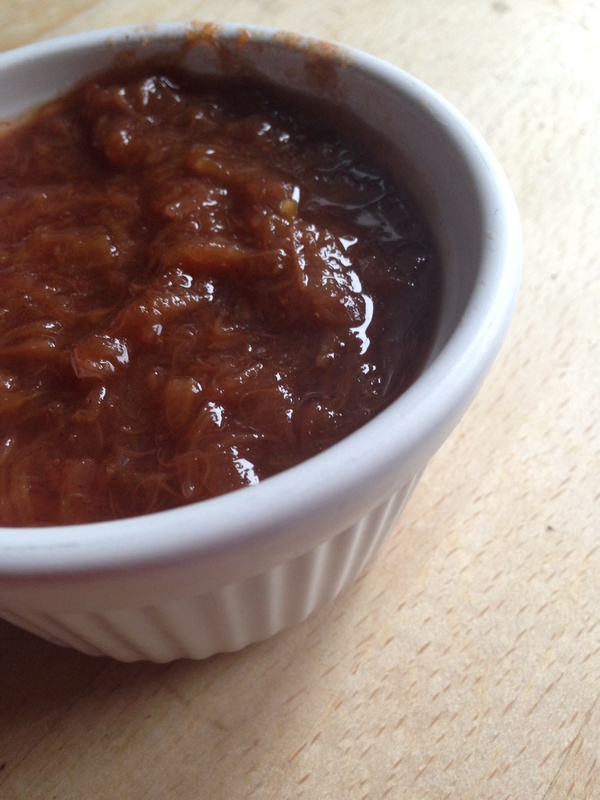 Yes, brilliant chutney! 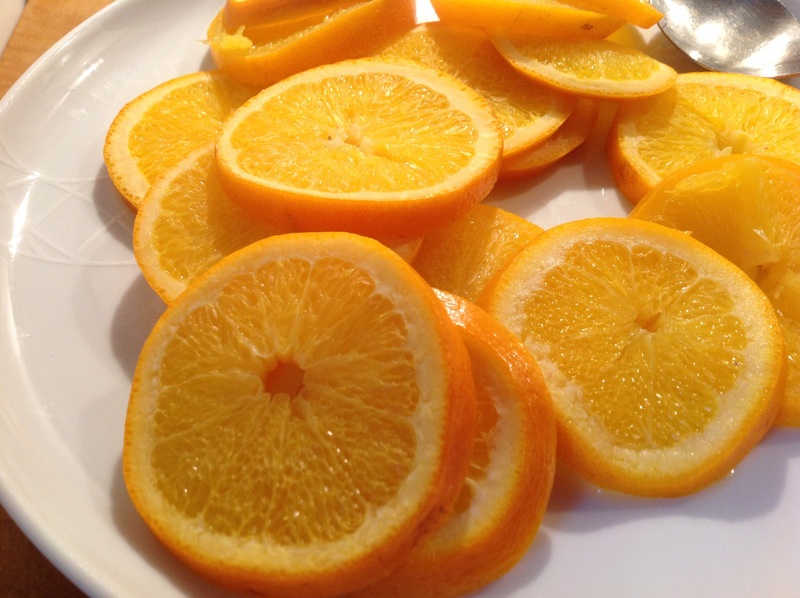 I actually made this yesterday when I was having an orange kind of a day! 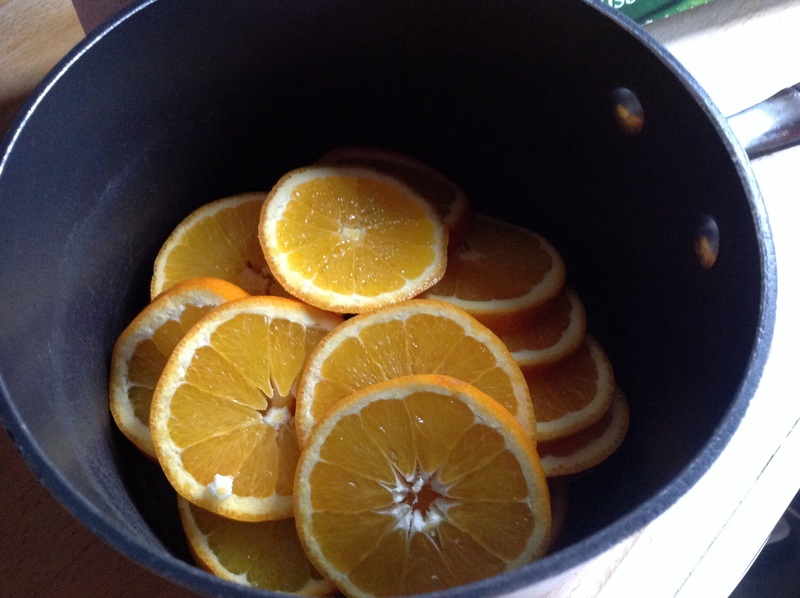 I only had 4 oranges left so I halved this to make with three. 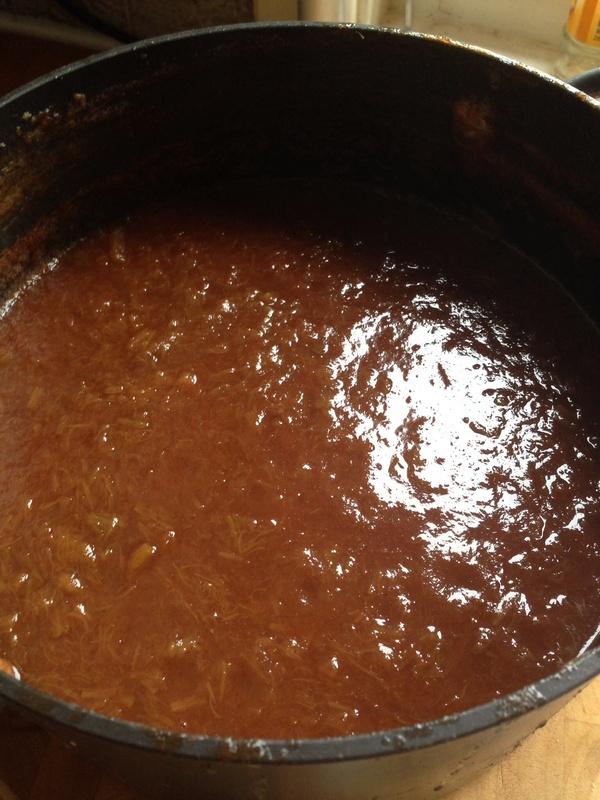 First off I sliced into rings..
Then I covered with water and left to simmer for 45 minutes and by then the rind was really soft..
Then I added the sugar, vinegar and spices to the water and left to simmer. It did seem like a lot of ground cloves and the smell was really strong. After 10 minutes I added the orange rings, it says to leave them in until the rind becomes clear, but I had to assume it’s the inner rind and not the actual orange bit. I did think I’d left them simmering a tad too long as a few of them had completely broken down. 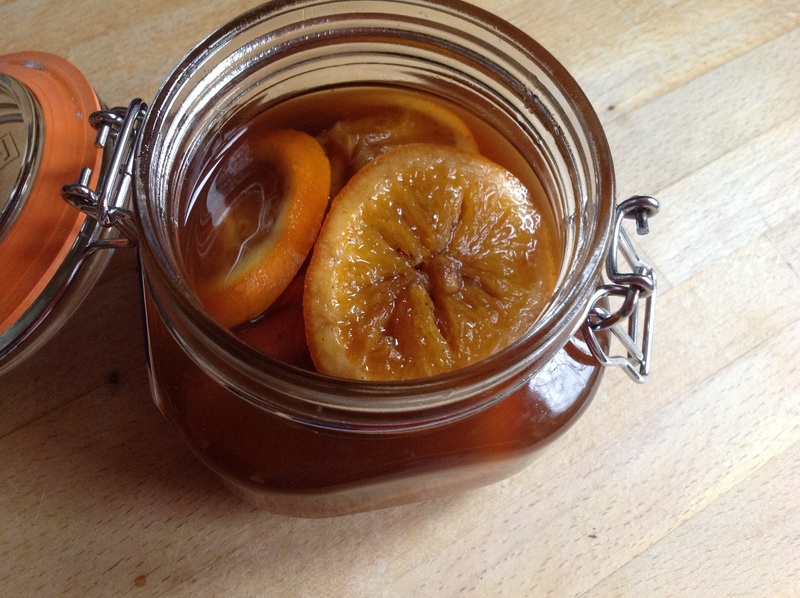 I potted what I had into one large sterilised jar..
Then I had the remaining liquid simmering for about another 10-15 minutes before I thought it was done, then I let it cool before I poured it over the slices. 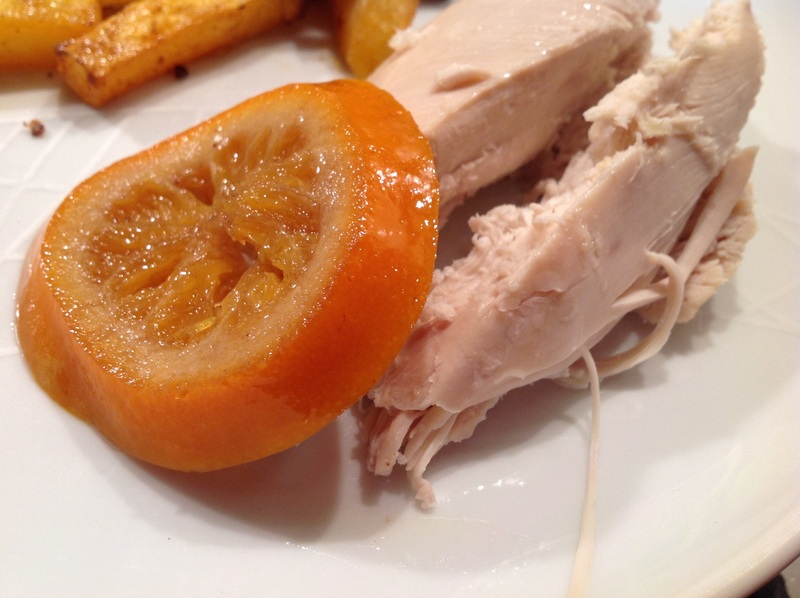 So tonight we were having roast chicken for dinner so I served a slice of pickled orange on the side..
Would I make this again? Yes, much nicer then expected! This sounds like quite an unusual recipe, I do like melon but can’t imagine it being pickled! I didn’t want to make too much in case I didn’t like it so I ended up only using half a melon and reducing the rest if the ingredients.. I started this last night and wasn’t quite sure how I should be cutting the melon. It says half an inch slices so does that mean long slices?? 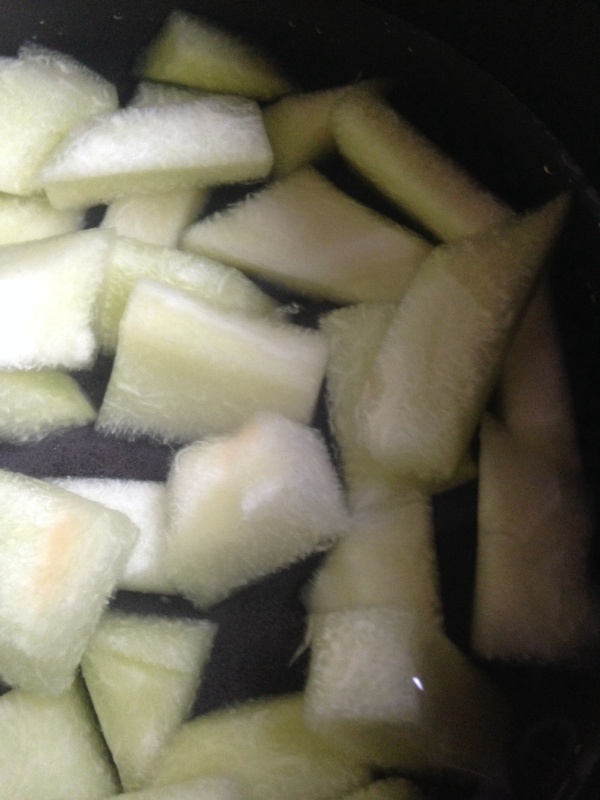 I had kind of butchered the melon when taking the skin off so I had to make do with chunks! I also had no idea what a quart is and according to whatever page I searched on it is 1136ml, so that’s what I used. After a night of soaking in the salty water it didn’t look any different..
Then I simmered them in fresh water, and it doesn’t give a time so my advice is not to leave it too long. I walked away and left it simmering assuming it may take a while. When I returned it was ridiculously soft, so much so some of it was completely falling apart. It had gone slightly clear but I think was way past tender! 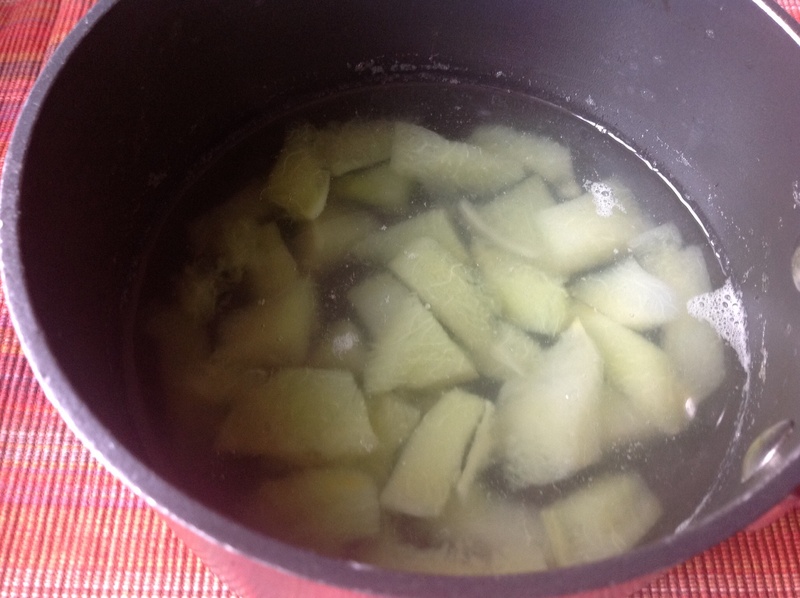 Then it took less than 10 minutes for the sugar and vinegar mixture to turn syrupy, so I had to attempt to spoon out what chunks of melon I had left. 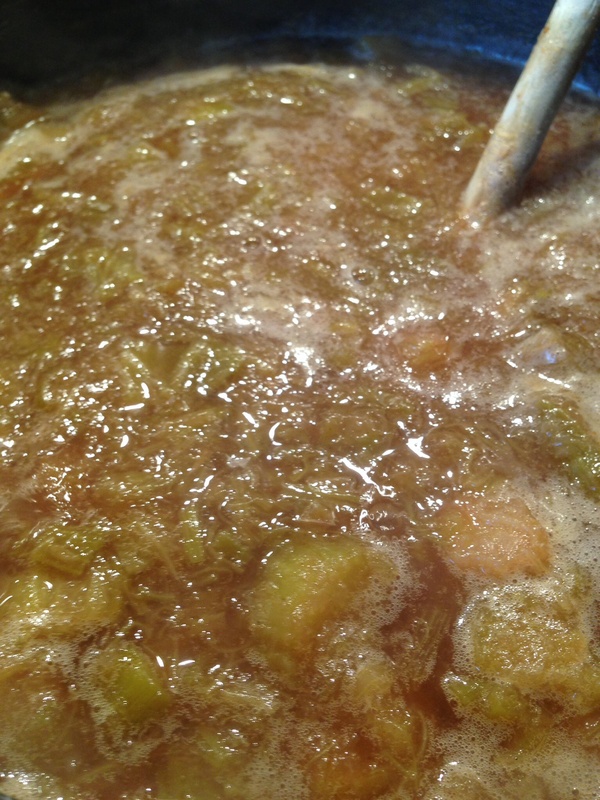 I then left it to simmer for the full 10 minutes, after which it was looking quite sticky and there really was no definite chunks left! 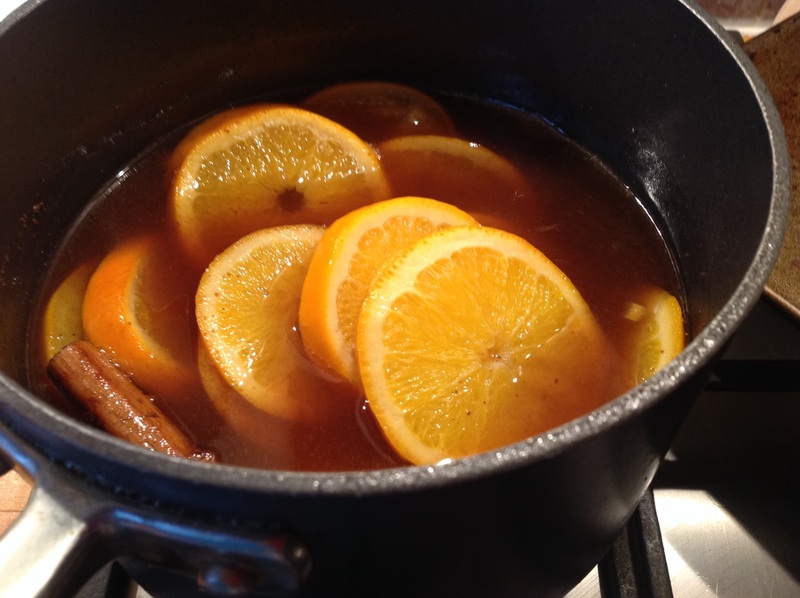 I also couldn’t decide if I was meant to remove the cinnamon and cloves before jarring, but I decided to leave them in to add more flavour. I only ended up with half a jar and have absolutely no idea if this looks right. 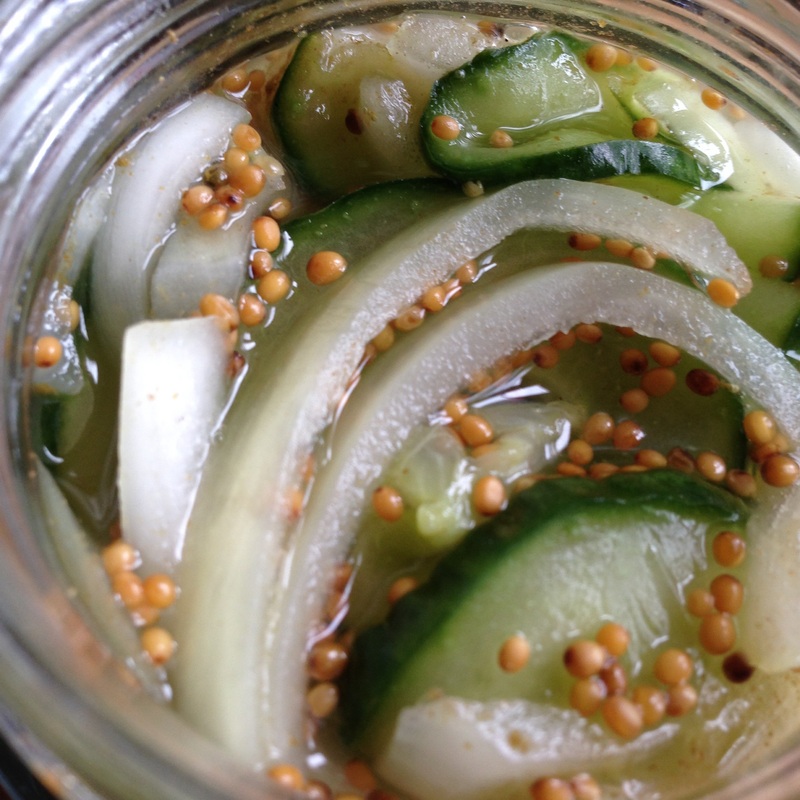 I know your usual sandwich pickle is quite chunky but maybe the idea of this is more of a soft chutney??? I was just going to try this with some cheese, and all I had was brie. This unusually lovely! If I didn’t know that melon was in this I think I may have struggled to pick that out. It does taste fruity but not obviously like melon! 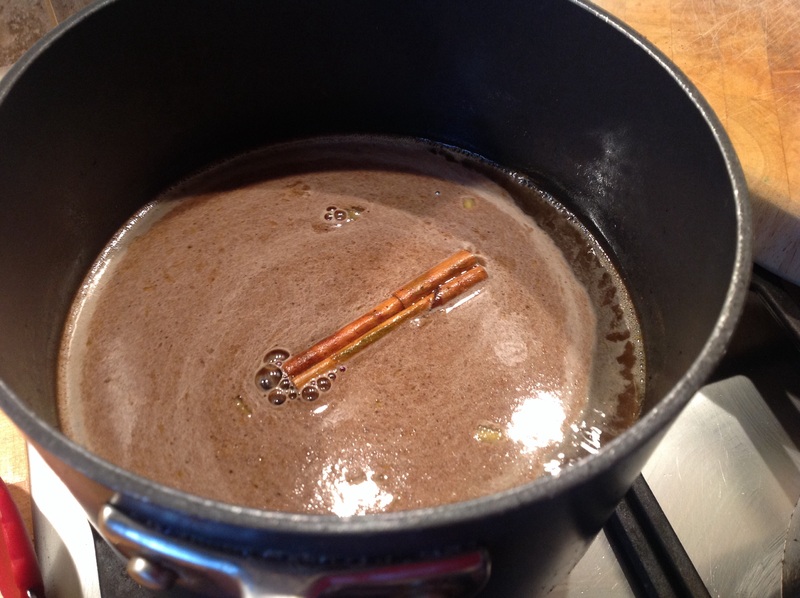 Then cinnamon is quite strong which I really like and you do just get a slight hit from the cloves. 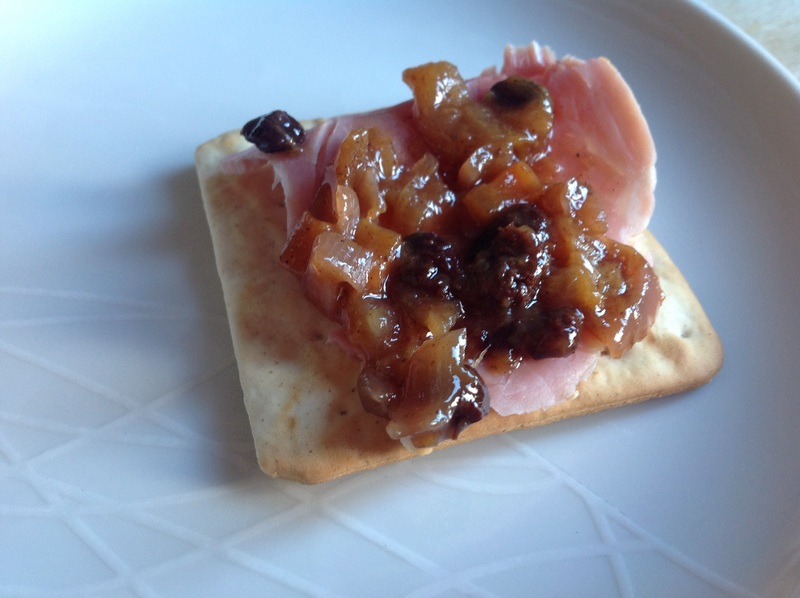 I really liked this, but I think it needs a bit longer on the cupboard to really let the flavours develop and would be better with a hard cheese or with some pram ham. 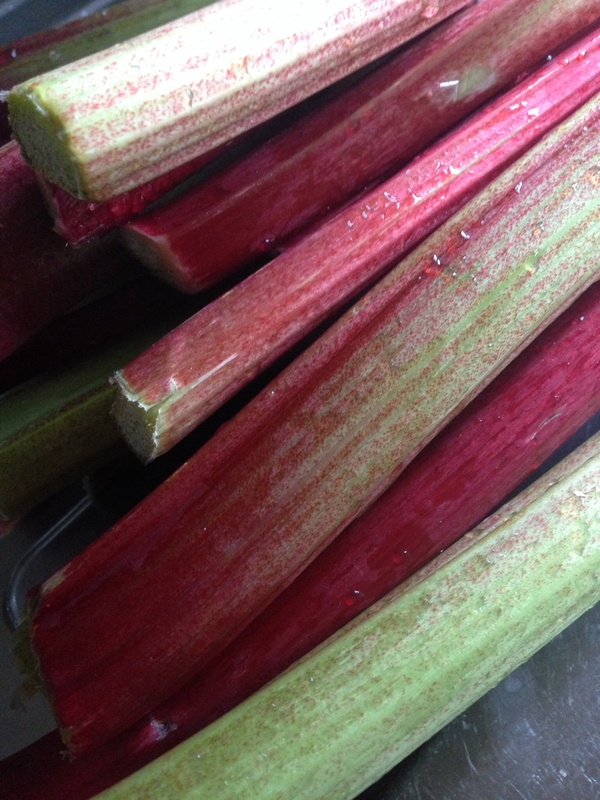 I was given a load of rhubarb from my sister boyfriends parents! I do grow my own but it’s always so skinny looking, and this stuff looks much better. 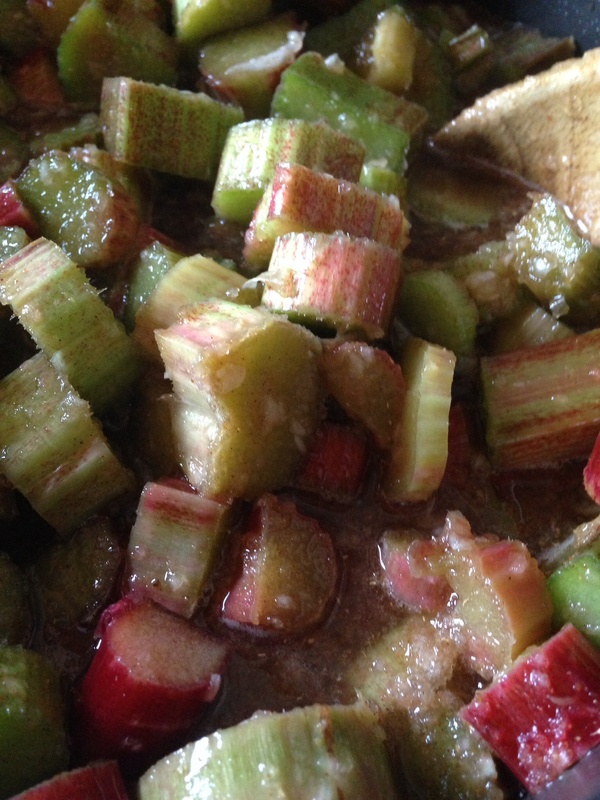 I had exactly 5lb of rhubarb so I decided to make the full quantity, it was loads once I had cut it all up..
Then after an hour it was much darker and really nice and thick looking..
Again I sterilised my jars in the oven and I ended up with 6 random sized jars and a wee extra in a ramekin for me to try today! 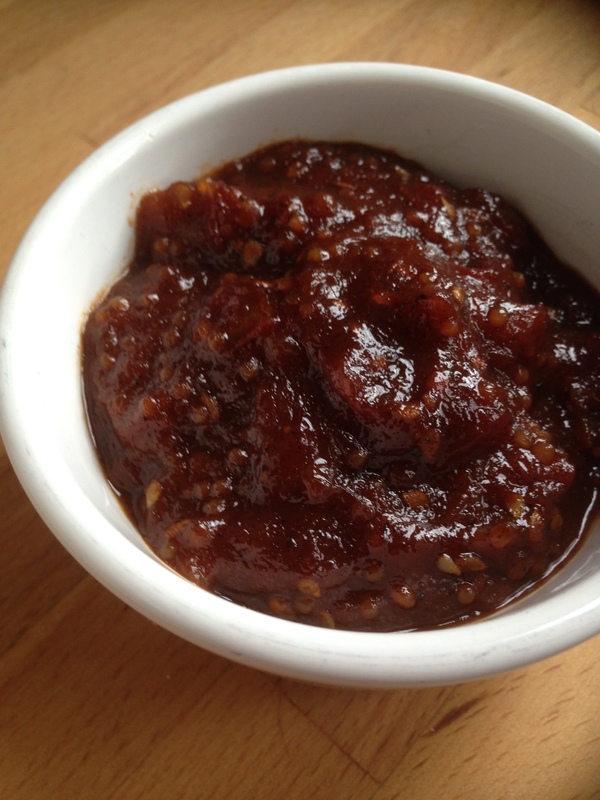 I love chutney and think helps make a good sandwich great! 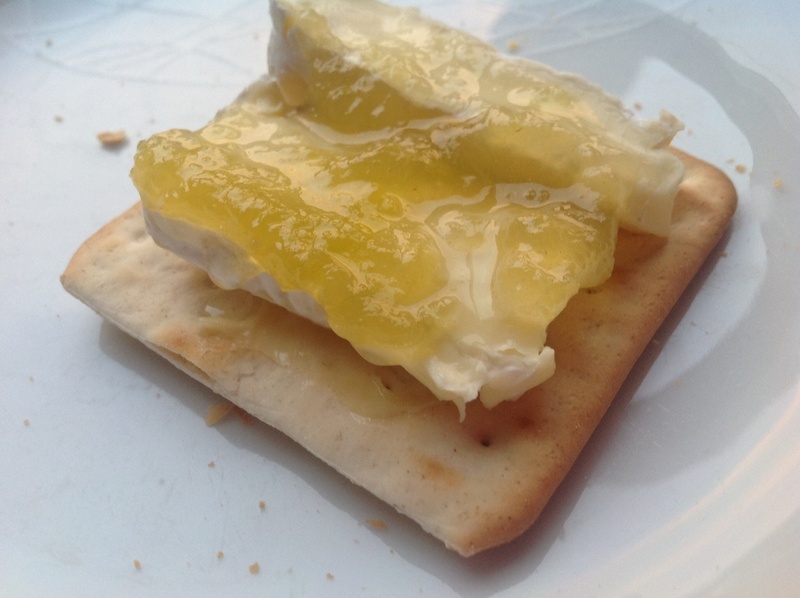 I was trying this first off with some cheese and crackers and it’s fab! It’s a really good consistency and a lovely sharp flavour. I did worry that it was loads of vinegar but it’s just perfect. Am now very much looking forward to this weeks sandwiches!! Would I make this again? Yes, I do have 6 jars to get through but that won’t last that long!! I decided to make this today because my daughter loves mushrooms and ketchup! I had a load of mushrooms in the fridge but I think I overestimated how much they weigh. 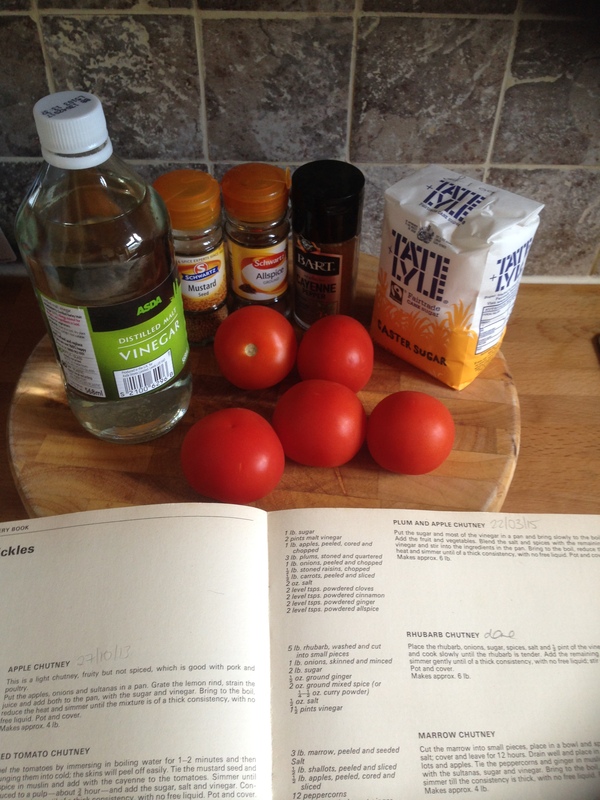 I ended up with only half a pound so I had to reduce all the rest of the ingredients by a sixth, which is quite tricky! I do have a great set of spoons that go as small as an eighth of a teaspoon so I think I managed to measure everything ok.
I’ve been really lucky that a good friend has given me a supply of mace. I’ve not been able to get it in the shops so when she offered me a supply I think I just about bit her hand off!! I wish I had taken a before and after photo of the mushrooms. I couldn’t believe the reduction in them after the overnight soaking in the salt. This was smelling great as it was cooking, but after only 30 minutes there was no liquid left so I took off the heat. I tried as best as I could to push the mixture through the sieve. I don’t have a nylon sieve but had to assume a regular sieve would work the same. After about 10 minutes I had to give up because my arms were aching. 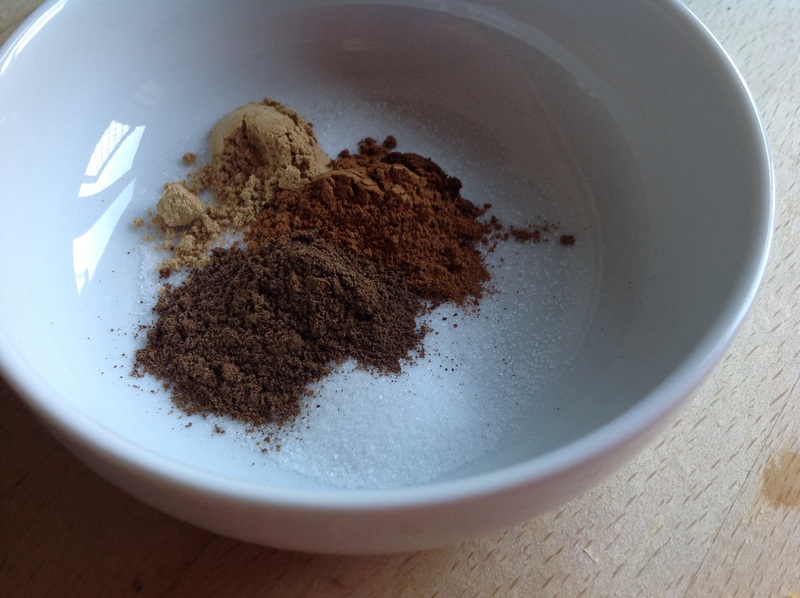 I wasn’t sure if the whole mixture should be passed through the sieve or just all the liquid. So at this point it looked seriously revolting! I didn’t know what I expected but it just looked like sludge! 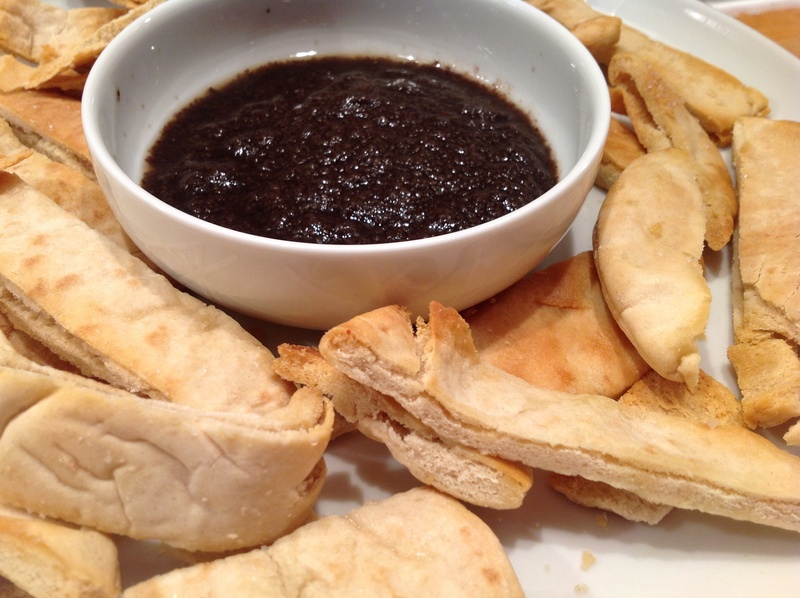 I decided to make some pitta bread crisps and served it with that. Well I was pleasantly surprised, this is actually quite delicious! 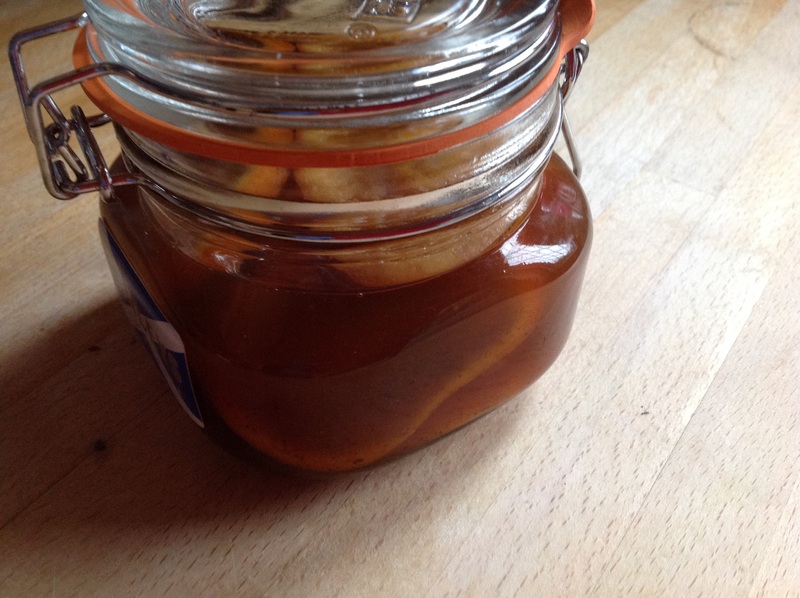 Yes it’s very strong with the vinegar but you do get so some really nice flavours from the rest of the ingredients.